Express two-day shipping is included on this gift.Only standard shipping and processing charges will apply. Please note:To avoid weekend transit, orders placed after 10AM PT / 1 PM ET on Wednesday will ship on Monday of the following week. Deliciously decorated for your Easter and spring feasting table, this Carrot Cake Roll is filled with cinnamon, golden raisins, walnut pieces, shredded carrots, and a vanilla cream cheese filling. 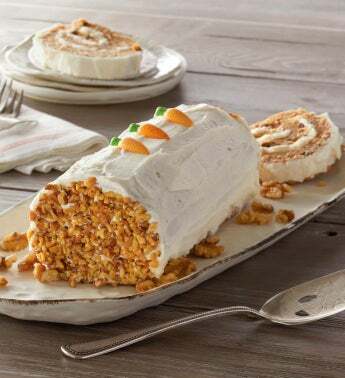 All of these decadent ingredients are rolled up with care, then frosted and decorated with walnuts and white chocolate carrots. Simply slice and serve for an elegant and most flavorful dessert.